Incineration is a common way to dispose municipal solid waste (MSW) and simultaneously generate energy . This waste-to-energy incineration process is being increasingly used and is a viable management strategy for treating the increasing amounts of MSW that are not recyclable [1, 2, 3]. MSW incineration (MSWI) can reduce the waste mass by 70% and waste volume by 90% [2, 3, 4]. Consequently, MSWI produces two main solid by-products, which are divided into bottom ash (BA) and fly ash (FA) [3, 4]. Any metals present in the disposed waste will end up in these fractions, which are currently notably underutilized. Fly ash is the finer fraction collected from flue gas by air pollution control (APC) devices such as cyclones, electrostatic precipitators, fabric filters, or scrubbers. The composition of the dust is affected by the purification method used, temperature, and additives . Fly ash is considered toxic waste due to the enrichment of heavy metals, such as Pb, Zn, As, and Cd into this fraction during combustion. According to Jung et al. , approximately one-third of Pb and Zn is distributed to fly ash due to volatilization. The relative amount of chlorides can also be higher in fly ash compared to bottom ash due to the lime scrubber used in the APC system . To protect the environment and ensure safety for human health, these ash fractions are subjected to different unit processes prior to landfilling. Heavy metals need to be properly cleaned from fly ash due to the risk of metals being released into the environment . The main treatment technologies used for MSWI fly ash are washing, chemical stabilization, and solidification as well as thermal treatment . The challenges of landfilling are that the toxic ash material is required to be deposited in specialized sites at high cost, with the risk of environmental pollution and simultaneously the possible loss of valuable metals [9, 10]. However, it is increasingly difficult to find sites for landfills, and therefore an increasing part of the streams currently classified as waste is becoming a resource. The recovery of metals from fly ash can be considered a source of valuable metals that would otherwise be landfilled; in addition, this would result in an ash residue fraction with lower concentrations of toxic metals . At the moment, according to the London Metal Exchange , the prices of pure Cu, Ni, Pb, and Zn are as follows: Cu 6 257 US$, Ni 12 895 US$, Pb 1 996 US$, and Zn 2 546 US$. This indicates that for 1 t of fly ash the value of metals is approximately 50 US dollars if counted in terms of pure metal value. Especially, nickel is a valuable battery metal with growing demand [12, 13], specifically for lithium ion batteries . Therefore, improved Ni extraction of secondary raw materials is of vital importance. These reasons create not only an environmental but also an economic driving force to recover these metals, thus progressing toward the circular economy of metals. Hydrometallurgical treatment of fly ash can provide new metal extraction possibilities and should be considered an alternative treatment for recovering valuable metals from fly ash. To achieve a selective and low-cost process, the lixiviant used should be carefully chosen and adapted to the properties of the ash . Luo et al. reviews the extraction methods of MSWI ashes, highlighting that mineral acids and alkaline solutions are effective for removal of Cr, Cu, Zn and Pb, whereas organic acids are not as effective, even though soluble metal complexes are forming in these solutions. Mineral acids include hydrochloric acid [9, 16, 17, 18], sulfuric acid [19, 20, 21], and nitric acid [19, 22], these being mostly used due to high solubility of several metal compounds at low pH . Cationic leaching pattern is proposed for most of metals species, such as Ca, Cu, Mn, Zn, Cd and Pb . Furthermore, organic acids have been seen as potential lixiviants for fly ash leaching, for instance, citric acid [8, 16, 24, 25, 26], oxalic acid [20, 24, 27], and acetic acid [20, 28]. Additionally, some other lixiviants such as EDTA [20, 29], sodium acetate , sodium hydroxide [22, 29], and thiourea  have been investigated for stabilization of fly ash. Fedje et al. concluded that mineral acids are more effective compared to organic acids in the leaching of Cu, Zn, and Pb from MSWI fly ash. However, leaching of Pb, which is the major toxic element in fly ash, cannot be conducted in sulfuric acid due to the formation of PbSO4 . According to Huang et al. , hydrochloric acid appears to be a potential candidate for fly ash leaching, as Pb is able to complex with chloride anions as PbCl42−, even though the formation of insoluble PbCl2 is also possible. Fedje et al. stated that organic acids are not generally effective leaching agents for metals; however, the benefit of organic acids is their biodegradability. Nevertheless, the recovery of metals from organic acids can be challenging, similar to chelating agents . A new group of lixiviants, deep eutectic solvents or molten salts, have attracted interest in metallurgical research due to their ability to leach refractory ores. The dissolution of metal oxides , electric arc furnace dusts , and selective leaching of metals from mixed metal oxides has been investigated in deep eutectic solutions . Therefore, deep eutectic solvents may also be interesting and environmentally benign leachants for fly ash. 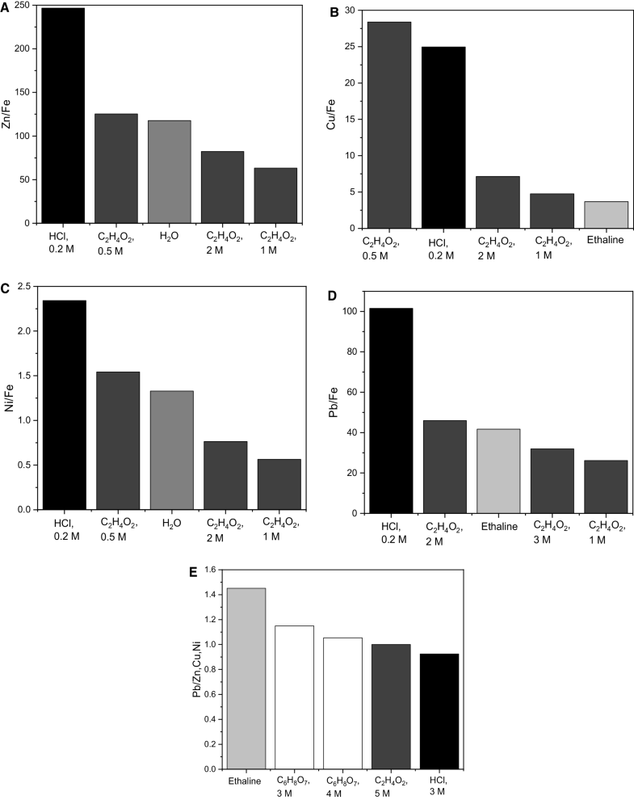 The objective of this paper is to fill the research gap by building a comparable leaching behavior map of potential lixiviants in metal rich fly ash leaching. The research contains a wide set of lixiviants (HCl, H2SO4, C2H2O4, C6H8O7, C2H4O2 acids, water, and the deep eutectic solvent, ethaline, i.e., choline chloride, C5H14CINO + ethylene glycol HOCH2CH2OH, in a ratio of 1:2). The leaching phenomena related to main valuable and toxic metals of interest (i.e., Zn, Cu, Ni, Pb, and Fe) were investigated, and specifically the focus was in selective leaching vs. Fe, which is the dominating and costly impurity metal in hydrometallurgical processing. Good selectivity (vs. Fe) reports directly to decrease in process costs: (1) decrease in opex, i.e., no need to Fe precipitation chemicals, (2) decrease in capex along the decrease in the required process retention time (i.e., the amount/volume of reactors) needed for Fe precipitation, (3) decrease in capex and opex as no Fe residue filter, residue washing and disposal of iron residue is needed. In the current study, also, the use of ethaline in fly as leaching was investigated for the first time. The comparable map provides new data and observations of leaching phenomena that can grant good basis for the further development of metal recovery from fly ash and thus contribute into the improved circular economy of metals. The composition of the raw material (fly ash from waste gas purification) used in this research is depicted in Table 1. The raw material was supplied by a Finnish incineration plant. The main elements of interest were Zn (1.1 wt%), Pb (0.8 wt%), and Fe (1.5 wt%) as well as the minor elements of Cu (0.06 wt%) and Ni (0.03 wt%). The raw material was analyzed by X-ray fluorescence (XRF), as well as by total leaching by atomic absorption spectroscopy (AAS, Varian AA240, USA) and inductively coupled plasma optical emission spectrometry ICP-OES (ICP Perkin Elmer Optima 7100 DV, USA). Further characterization of the material was performed with an SEM-EDS (scanning electron microscope, LEO 1450 VP, Zeiss, Germany, Energy dispersive X-ray spectroscopy, Oxford Instruments INCA software). The samples were pressed into pellets using a hydraulic press (Compac, Denmark). The pellets were cast into epoxy resin for microanalysis. The SEM-EDS analysis showed that the fly ash is mostly amorphous, which is why analysis could not be conducted adequately by the SEM-EDS method. However, the SEM-EDS results also indicated that the ash particles contained at least Na, Mg, Al, Si, S, Cl, K, Ca, Ti, Mn, Fe, Cu, Zn, and Pb. 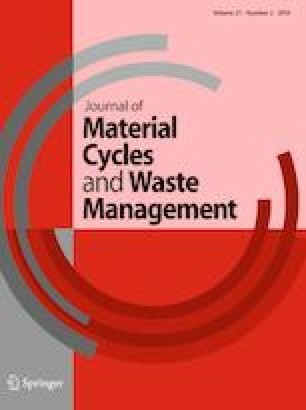 The results presented on this paper are validated for the specific type of fly ash provided by Finnish industrial incineration plant from specific waste gas purification stage from the incineration of hazardous type of waste. The material used in this study contains similar amounts of Fe and Pb as described by Chandler et al. The zinc content in this material is lower compared to values observed by Huang et al. [17, 26] Cu and Ni corresponded to concentrations presented by Chandler et al. The concentrations of Cu, Ni, Pb and Zn are in range of general fly ash compositions reported by Jiao et al. This suggests that the leaching behavior discussed in this paper can also be adapted to other fly ashes. However, it needs to be noted that the other metals, such as Na, Si, and Ca can complicate the dissolution of valuable metals. The leaching tests for fly ash were conducted at 33 °C in ambient pressure and in the absence of oxygen purging. The studied lixiviants were water, sulfuric acid, hydrochloric acid, citric acid, acetic acid, oxalic acid, and ethaline (choline chloride, C5H14CINO + ethylene glycol HOCH2CH2OH, 1:2). The chemicals used and investigated concentrations are listed in Tables 2 and 3, respectively. The concentrations of 0.2–7 M were investigated for mineral acids. The concentrations for organic acids were limited by the solubility of organic acids into water. Ethaline solution was prepared by measuring one part of choline chloride, C5H14CINO, and two parts of 1,2-ethanediol into a beaker . The beaker was heated up to 80 °C and stirred with a magnetic stirrer (IKA® RT10) until the solution was clear, after which the solution was allowed to cool down. In each test, the solid-to-liquid ratio used was 50 g/L, and mixing was conducted with a magnetic stirrer at 300 RPM for 24 h. The pH and redox were measured before and after the 24 h leaching time using a Mettler Toledo Inlab® saturated calomel electrode (SCE) vs. platinum wire for redox potential and Hanna Instruments edge® Multiparameter pH Meter-HI2020 for pH. At the end of each leaching experiment, the leach residue was filtered, dried, and the metal extractions were then calculated based on solution analysis by a commercially accredited laboratory (Labtium Oy, Espoo, Finland). Filtration was performed at room temperature under atmospheric conditions with a vacuum filter using double filter paper (Munktell, grade 10, size Ø 90 mm) in a Büchner funnel. The filtrated solution samples were analyzed by AAS and ICP-OES. The selectivity coefficient was calculated by comparing the ratio of the dissolved elements in solution, for example c(Cu)/c(Fe). The main interest was to evaluate the selective dissolution of valuable metals compared to iron, which precipitates back into the neutralization residue of hydrometallurgical operations, if dissolved. The extraction of Zn, Cu, Ni, Pb, and Fe was investigated in all leaching tests at T = 33 °C. The redox potential was measured before and after 24 h of leaching. The measured pH and redox potentials are presented in Table 4. It can be seen that, in hydrochloric acid the final pH varied between − 1.2 and 2.9. In sulfuric acid the pH varied between − 0.9 and 1.1, and in oxalic acid the pH varied between 0.6 and 0.5 after leaching. Acetic acid had the highest final pH values, which varied between 2.5 and 4.1. In addition, citric acid had final pH values of 1.3, 1.8, and 2.3 in 0.5, 1, and 2 M solutions, respectively. In general, the mineral acids were shown to be more oxidative with redox potentials of around 400–600 mV vs. SCE, whereas for organic acids the redox potentials were between 250 and 425 mV vs. SCE. The lowest redox potential values were measured in water, around 150 mV vs. SCE. Significant amounts of Zn can be found in fly ash material due to the volatilization of metallic Zn and ZnCl2 during the incineration process, following adsorption of vaporized metals on fly ash particles . In general, higher incineration temperatures support the volatilization of Zn and other volatile metals such as Cd, Pb, and As . However, according to Jung et al. typically only one-third of the total zinc is found in the fly ash in industrial plants, whereas the rest are present in the bottom ash fraction. This was found to be due to the predominance of non-volatile zinc phases such as zinc oxides in the raw material . Elementary Zn is known to be acid-dissolvable (E0 = − 0.76 V), explaining the high extractions in sulfuric acid and hydrochloric acid media even at temperature (T = 33 °C), see Fig. 1a. The highest extraction (> 80%) was achieved with 3 M sulfuric acid and 7 M hydrochloric acid. However, more dilute 0.5 M H2SO4 and 2 M HCl were able to provide significant Zn extraction of 76.9% and 76.5%, respectively, and even 0.2 M H2SO4 and HCl were able to dissolve > 42% of Zn. The highest Zn extraction in organic acids was observed in citric acid (approx. 50%). With acetic acid, approx. 40% extraction was achieved, whereas oxalic acid realized an extraction of below 20%. The results also showed 20% extraction of Zn in ethaline; however, a remarkable observation is that water alone was able to dissolve almost 13% of Zn, see Fig. 1b. This shows the reactive nature of the investigated fly ash, requiring chemical stabilization even when in contact with water. Although the amount of Cu in the fly ash is 1 decade lower compared to Zn, the economic value of copper drives its recovery. The study showed Cu extraction > 80% being achievable in all investigated HCl and H2SO4 concentrations (0.2–7 M), Fig. 2a. Additionally, citric acid (0.5, 1 and 2 M) was able to extract > 80% of Cu into the solution and also in acetic acid, approximately 70% of Cu was extracted in all studied concentrations. Oxalic acid did not provide equally high extractions, having Cu yield of only 25% into the solution. With ethaline, almost 50% copper extraction could be achieved at 33 °C. The kinetics of Cu+/Cu2+ redox couple has been investigated in ethaline by Lloyd et al. and the copper is known to dissolve in ethaline forming chloride complexes. However, even water dissolved minor (3–4%) of Cu, Fig. 2b. The results suggest that Cu is in easily dissolvable form in the fly ash, as nearly complete copper extraction can be achieved even at the lowest investigated mineral acid concentrations (0.2 M). The fly ash raw material investigated here contained a minor amount of Ni (296 ppm). The results show that with mineral acids at 33 °C, almost 100% extraction of Ni could be achieved. However, the dissolution required high acidity to reach maximum extraction (3 M HCl or 5 M H2SO4), see Fig. 3a. Organic acids were not able to leach Ni as efficiently with the highest extractions 33% with 3 M citric acid, 25% with 3 M acetic acid, and 14% with 0.5 M oxalic acid. Again, water was shown to dissolve a notable amount of nickel (6%), whereas ethaline dissolved only 4%, see Fig. 3b. Pb volatilizes at as low as 430 °C, thus being the main toxic metal in fly ash . It is in the interest of incinerator plants to remove Pb to produce safely disposable leaching residue. Figure 4a presents the extraction of Pb in the solutions under study. It is evident that increasing acid concentration increases Pb extraction—the exceptions being sulfuric and oxalic acid. Sulfuric acid supports the formation of insoluble lead sulfate [37, 38]. Moreover, oxalic acid did not leach Pb. According to Fedje et al. , Pb precipitates as PbC2O4 in oxalic acid. This phenomenon has also been found in other studies [16, 25]. This allows other metals to be dissolved selectively vs. Pb in sulfuric acid and oxalic acid; however, in that case secondary leaching or a stabilization process is required for Pb-enriched residue. The solution providing complete extraction of Pb was HCl (3M), but all the investigated HCl concentrations provided > 70% extraction, with the exception of the 0.2 M solution. In addition, 3 M citric acid was able to dissolve 98% of Pb. Gargul et al. describe a similar trend of Pb extraction at 25 °C, in which the extraction first increases and then decreases at high citric acid concentration. Acetic acid also showed increasing extraction with increasing acidity, the highest extraction of 65% being achieved at 5 M acetic acid. Figure 4b presents the extraction of Pb in water and ethaline. In contrast to Zn, Cu, and Ni, water could not dissolve Pb at all. Ethaline was shown to dissolve as much as 50% of Pb. The extraction of Fe is known to be a very pH-dependent phenomenon. In general, mineral acids were shown to result in lower final pH values compared to organic acids, see Fig. 5a. The current study showed that Fe extraction in hydrochloric and sulfuric acids increased with an increase in acid concentration. With sulfuric acid, the extraction of Fe was constant (60%) with an acidity of 2–5 M (measured pH between − 0.2 and − 0.9) but increased up to 80% in 7M. Hydrochloric acid resulted in quite a similar Fe extraction pattern, see Fig. 5b. Selective leaching of other metals vs. iron was shown to be possible in 0.2 M HCl, as the final pH of 2.9 indicates that iron had precipitated into the leach residue. Of the organic acids, the highest Fe extraction (> 60%) was achieved with oxalic acid, having the lowest final pH of the investigated organic acids. In oxalic acid iron can dissolve as soluble FeC2O4 [25, 40]. In contrast, citric acid was able to leach only 15–20% of iron in the measured pH range of 0.2–2.3. Additionally, with acetic acid, less than 2% of iron was leached, with the final pH value (2.5–4.1) supporting iron precipitation as hydroxide. Fe did not dissolve into ethaline or water—extraction being 0.08% in water and 0.5% in ethaline. In hydrometallurgical processing, there are typically several reactors and leaching stages which not only assure time for chemical reactions to occur but also enable tailoring of the process conditions for feasible metal recovery. Typically, iron is dissolved in the first acid leaching stage along the valuable metals, whereas neutralization/precipitation chemicals are added and pH increased in the next stage to remove iron . In state-of-art technologies, iron is removed from hydrometallurgical processing circuits as hematite, goethite, and jarosites and disposed at waste ponds . Selective leaching of valuable or other target metals vs. Fe can bring both economic and environmental benefits, as iron dissolution, chemical consumption and waste formation can be minimized. This highlights the importance of selective valuable (or toxic) metals dissolution. In the investigated raw material, Zn is the dominating valuable base metal whereas Fe cannot be recovered from the solution as a valuable product. Figure 6a presents the Zn selectivity factor calculated based on soluble Zn and Fe concentrations (mg/L). The results show that the selectivity ratio between Zn and Fe was remarkably good with the 0.2 M HCl solution, with a value of 247. In addition, acetic acid (0.5 M) and water showed high selectivity between Zn and Fe (> 100). Also, ethaline showed some selectivity between Zn and Fe (22–30). However, the final extraction of Zn in these solutions was only 42% in 0.2 M HCl, 37% in 0.5 M acetic acid, 13% in water, and 20% in ethaline. The same solutions were also shown to provide good selectivity regarding copper dissolution: 0.2 M HCl and 0.5 M acetic acid provided the highest Cu/Fe ratio (25 and 28) as well as high extractions (85 and 70%, respectively), see Fig. 6b. The Ni content (296 ppm) in the raw material was half that of copper. However, none of the investigated solutions provided good selectivity between Ni and Fe, see Fig. 6c. Minor selectivity of Ni vs. Fe was achieved in 0.2 M HCl (2.3), 0.5 M acetic acid (1.5), and water (1.3), with corresponding Ni extractions of 16%, 20%, and 6%, see Fig. 6c. Selective leaching of Pb vs. Fe was investigated as a possibility for removing lead selectively from fly ash raw material. Figure 6d presents the selectivity factor of Pb and Fe in all the studied conditions. It can be seen that 0.2 M HCl shows superior (> 100) selectivity, but 2 M acetic acid (46) and ethaline (42) can also provide high selectivity between Pb and Fe, with the corresponding extractions being 27.3%, 34.1%, and 51.7% for Pb. In addition, the selectivity of Pb toward valuable metals is presented in Fig. 6e, to observe whether toxic Pb can be removed from fly ash material prior to valuable metal recovery. The results suggest some selectivity by ethaline (selectivity factor 1.45), the extraction being 50%. However, all the selectivity factors in Fig. 6d are low compared to the selectivity factors calculated for Zn, Pb, and Ni toward Fe. This suggests that Pb can be dissolved selectively vs. Fe, although not toward the other valuable metals of interest (i.e., Zn, Cu, Ni). This highlights the importance of solution purification—as the results suggest that the conditions allowing Pb dissolution also support the dissolution of Zn, Cu, and Ni. However, sulfuric acid provides a medium that supports the separation of Pb over valuable metals by dissolving the latter and leaving Pb in the leach residue as precipitated lead sulfate (Fig. 4a). The highest extraction of valuable metals in general was achieved with HCl and H2SO4. The highest Zn extraction (> 80%) was achieved with 3 M H2SO4 and 7 M HCl. These conditions dissolved > 87% of Cu and > 65% of Ni. The best leaching conditions for Ni were obtained in high-acidity mineral acids, i.e., 3 M HCl and 5 M H2SO4. Organic acids did not leach metals as effectively as mineral acids. In acetic acid, C2H4O2, Zn extraction was 35–39% at all studied concentrations. More than 70% extraction of Cu could be achieved at higher acetic acid concentrations of 3, 5, and 7 M. However, Ni extraction remained low (< 25%). Citric acid extracted around 45–50% of Zn and > 60% of Cu, whereas oxalic acid (C2H2O4) resulted in poor Zn, Cu, and Ni metal extractions (< 30%). Ethaline displayed the capability of dissolving Zn (20%), Cu (49%), and Pb (50%); however, no Ni or Fe was dissolved in the ethaline. The best conditions for Pb leaching were achieved in HCl and complete extraction was provided by 3 and 5 M HCl, but also more dilute concentrations, 0.5, 1, and 2 M of HCl were readily able to dissolve over 70% of Pb. Ethaline leaching of Pb displayed high selectivity toward Fe (41.7) and only minor selectivity toward the valuable metals Zn/Cu/Ni (1.5). Ethaline provided an advantage by not dissolving iron, although the extraction of valuable metal extractions was not as high compared to HCl. When considering high Cu extraction, high Zn extraction, and good selectivity vs. iron, 0.2 M HCl showed the best selectivity to recover valuable metals (86% of Cu, 43% of Zn) without the leaching of Fe. This is a significant finding, as no aggressive solution was required for the extraction process. Open access funding provided by Aalto University. The financial support of Fortum Oy is greatly appreciated. The CMEco (Circular Metal Ecosystem, Business Finland, Tekes, Grant number 7405/31/2016) project and Clic Innovation Oy financed this work as part of the Material Values Chains, ARVI project. This work was supported by “RawMatTERS Finland Infrastructure” (RAMI) at Aalto University (Academy of Finland). The provider of the raw material is also greatly acknowledged by the authors.